Zion Market Research has published a new report titled “Fracture Fixation Product Market (Internal Fixation Product and External Fixation Product) for Metallic Fixators,Bioabsorbable Fixators and Others: Global Industry Perspective, Comprehensive Analysis, Size, Share, Growth, Segment, Trends and Forecast, 2015 – 2021”. According to the report, the global fracture fixation product market accounted for around USD 6.70 Billion in 2015 and is expected to reach approximately USD 11.30 Billion by 2021, growing at a CAGR of around 9.1% between 2016 and 2021. A broken bone must be carefully stabilized and supported until it is strong enough to handle the body's weight and movement.Fracture fixation products are used to stabilize the fractured bone, which allows to return early mobility & full function of the injured extreme. Mostly, fracture fixation products are composite of metals or bioabsorbable types. Global fracture fixation product market is expected to witness exponential growth over coming years owing to the high prevalence of sports injuries, violence, road accidents, and rising adoption for orthopedic surgery for osteoarthritis.In addition, technological advancement in the fixation products and increasing government funding and grants in the industry are fueling the growth of fracture fixation products market.However, the immunological and inflammatory reaction are expected to restrict the growth of fracture fixation product market. By type, internal fixation product segment dominated the fracture fixation product market.Increasing demand of plates, screws, nails for surgical implants for bone repairs is expected to boost the demand for fracture fixation products.External fixation product segments are also expected to experience significant growth within the forecast period. 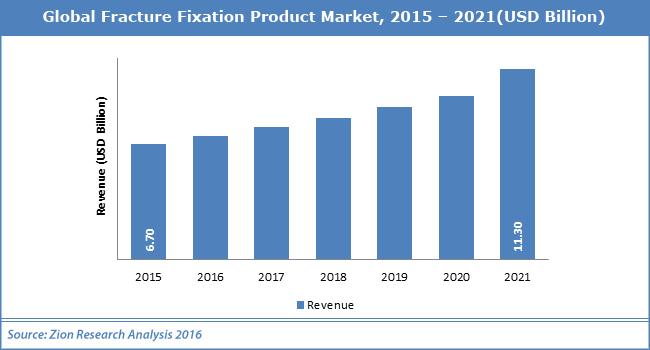 On the basis of composition, bioabsorbable fixators emerged as the leading composition segment in terms of global revenue in 2015. Rising sports injuries, road accident and fitness concern of society driving the growth of this segment significantly. Geographically, North America was the largest market for fracture fixation product followed by Europe. Moreover, fracture fixation product market has a huge opportunity in the emerging markets of Asia Pacific due to increasing population, rising government healthcare expenditure,and growing income levels in this region. Key players profiled in the report include Stryker Corporation, Zimmer Biomet Holdings, DePuy Synthes Companies, Néosteo SAS,Smith & Nephew and others. Zion Market Research is a market intelligence company providing global business information reports and services. Our exclusive blend of quantitative forecasting and trends analysis provides forward-looking insight for thousands of decision makers. Zion Market Research experienced team of Analysts, Researchers, and Consultants uses proprietary data sources and various tools and techniques to gather and analyze information. Our business offerings represent the latest and the most reliable information indispensable for businesses to sustain a competitive edge. Each Zion Market Research syndicated research report covers a different sector — such as pharmaceuticals, chemical, energy, food and beverages, semiconductors, med-devices, consumer goods and technology. These reports provide in-depth analysis and deep segmentation to possible micro levels. With wider scope and stratified research methodology, our syndicated reports strive to serve the overall research requirement of clients.